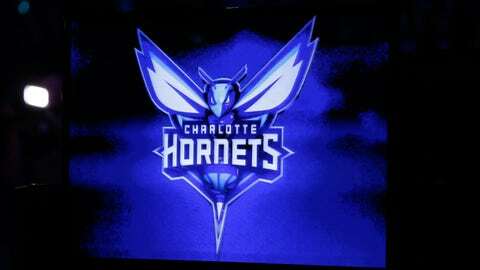 The Bobcats unveiled the logo that the franchise will use for its re-branding to the Hornets beginning next season. A packed Time Warner Cable Arena was on hand Saturday night as the Bobcats unveiled the new logo for their transition back to the Hornets. Maybe it was the free T-shirt to the first 10,000 or maybe it was the excitement of a three-game winning streak, but more likely it was a city excited to see the first peek of an identity that never should have left. The video playing at halftime unveiling the eight new logos said it best perhaps: "Our colors, our name are all coming home." Hugo, the Hornets long-time mascot, is back, too. Even their old stars came home. Former Hornets greats Muggsy Bogues and Kelly Tripucka stood alongside chairman Michael Jordan at mid court as he revealed the final piece of his most popular decision as owner. The classic, old school logo won’t be back though. NBA rules dictate that franchises can’t go back to past logos, and the unveiling of the new brand identity Saturday night showed a fiercer looking Hornet logo â a meaner look with more modern font type in the middle. It’s a clean look that should go over well with the fans. "There’s more fierceness in the face of this hornet and we realize that they’re relentless when they’re after their prey, they are very protective of their territory," President Fred Whitfield said. "That’s exactly what we want and hope for our franchise to be about when we step on the floor every night." They’re also hoping the new brand identity will bring back the buzz to the city around NBA hoops. The city that once led the league in attendance nine years running never embraced the Charlotte Bobcats. Bobcats brass is hoping that will change with the return to what was lost in 2002. They’ve embraced the Buzz in every sense, pushing a Buzz City campaign that they’re hoping will become as synonymous with Charlotte as Rip City is to Portland, and turn Time Warner Cable Arena into the Hive. "I think we want it to feel like the hive," Guelli said. "[Jordan] wants that type of atmosphere for our team." And although the logo’s going to be different from the past, that logo will still be available in their legacy line. Whitfield and chief marketing officer Pete Guelli point to the evolution of the logo with the Denver Broncos and New England Patriots as transitions they’re looking to emulate. "We didn’t reinvent the wheel in this process," Whitfield said. "There’s a lot of historic brands that have evolved over time and they found a great way to bridge the gap between where they were and where they are today." The Bobcats logo and moniker will officially be dead the day after their final game of the season, Whitfield said. However, you’ll be able to buy the new logoed merchandise starting January 18th as they’ve already started to liquidate their remaining Bobcats merchandise. Part of the exhaustive process was finding the correct shades of teal and purple that worked for 400 licensees. They think they’ve found that now, and now have to work to change 250 spots in the arena that will need a brand change with the new logo. "We wanted consistency and we wanted versatility," Whitfield said of the colors. There are still a number of other areas that still need ironing out with the logo complete. There’s the whole issue of where do the stats and records go for the Charlotte Hornets of prior years? Are they associated with the New Orleans Pelicans or does Charlotte get those back? It is unchartered territory that doesn’t seem to have a clear-cut answer at this point. Never before has a professional team left a city, had the name given up, and then returned to their prior city. "It’s been heavy on our mind. We’ve had conversations with the New Orleans folks, the NBA folks, because it’s never been done before," Whitfield said. "We’re all trying to come up with what is the right answer. There will be input from all three entities on where we land on those." Making it even dicier is some of the players that played on the last Charlotte Hornets teams went with them to New Orleans. So where does that go? How do you account for that? "It gets a little more complicated because there’s no delineation," Whitfield said. As they work through that, they’ll also be going through the process of designing and getting a new jersey approved, which should be available for unveiling "late summer" according to Guelli. Regardless, it’s going to be hard to mess them up. Guelli said the two research studies they did early last year showed 80 percent of fans viewed a move back to the Hornets favorably and Guelli said the merchandise is flying off the shelves. Everyone around the organization that had been around the city in the Hornets days knew it was the right thing to go back when the Pelicans relinquished the name, Whitfield said, but they didn’t want to make an anecdotal decision. They needed the numbers to back it up. They got them. Now Charlotte’s got their buzz back.